Share your craft business and promote yourself as a destination for craft in Scotland with our Craft Directory. Become part of our community today! The Craft Directory enables audiences to easily search and connect with places in Scotland who promote craft. This includes independent retailers, galleries and museums with a craft focus, as well as open studios and collectives. This is your opportunity to promote yourself as an important destination for the discovery of Scottish craft to a growing online audience which includes craft enthusiasts, consumers, collectors, makers and other industry contacts. With prominent links to your own website and social media, you can increase your online following and translate this into footfall, sales and commissions. You can apply quickly and easily online to join our Craft Directory using our online form. You will be asked to provide details of your business and credentials to support your application including high-quality images. A visually enhanced profile on the Craft Directory on www.craftscotland.org, a website that gets over 28,000+ hits per month. Places should fall into at least one of the Places categories. These are galleries, independent retailers, museums, open access studios, studios, further education facilities or online destinations. 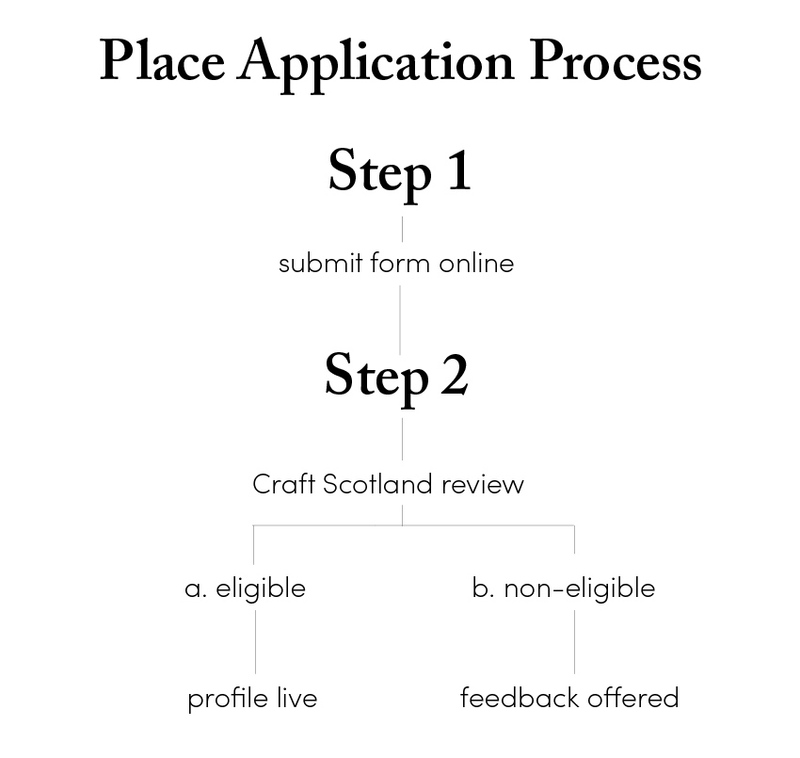 If you feel your craft business does not fit into one of these specific categories please contact Craft Scotland via email at shop@craftscotland.org or call us on +44 (0)131 466 3870 and we can discuss your suitability. If you would like more information about the Craft Directory, including application information and FAQ's, you can download our Craft Directory Places information pack. The Craft Scotland team will initially assess all applications. If you meet all of the Craft Places and Quality Criteria and your online form supports your application you will be marked as eligible. You will then be sent your annual payment link. If there is any minor feedback the Craft Scotland team will contact you directly. After payment, your profile will go live and you are then prompted to add more images and information. If you cannot meet the majority of the criteria, your application will unfortunately not be eligible to move forward. Craft Scotland is committed to supporting the craft sector and we can support you in growing your business through our What’s On listings and Resources pages.